Halloween is hands down one of my favorite times of the year. It is a time to cut loose and have some fun. Last year my family was a pack of rainbow unicorns. This year my daughter is going out as a creepy babydoll in one of my favorite vintage dresses. If I had the funds all of this Halloween Fiesta would have a place in my home. The frightful designs are delightful! For those that are in the Halloween spirit year-round you could most definitely use these fine pieces throughout the year. I know that I would. I have a love affair for anything with a skull or skeleton design. The Fiesta Skull and Vine pieces are my favorite out of this collection. They are available in white or black designs and my eyes are in love with the black line. Fiestaware is dishwasher safe, oven-safe, and microwave-safe. It also comes with 5-year chip protection. I have had my Fiesta since summer and have not gotten a single chip or scratch in any of my dinnerware and I use it for each and every meal. These are some very well-crafted pieces. Click the links below, images, or banner to shop! This is a generous-sized plate. This would be perfect for serving up your next big slab of ribs or whole chicken. Dimensions for this particular plate are diameter 11 3/4 Inches,Â and height 1 1/4 Inch. This spooky witch plate is the perfect size for your next Halloween meal. Fiesta lunch plates are 9″ Dia. x 1.125″H. This green plate depicts a witch on a broomstick flying over the moon. There is also a coordinating coffee cup to go with this witch plate. I am actually digging the black more than the white design (as shown above). The black would definitely be more of a perfect fit in my home. There are several coordinating accessories to go with this haunted Halloween design. I adore this Fiesta pasta bowl with a carved pumpkin design. This plate says has the words “Happy Halloween” down at the bottom. I have never had squid ink pasta but it seems like this would be the perfect bowl to plate it. This set of 4 frosted cooler glasses has a Day of the Dead skull design on the face of them. Dimensions on these are 5.75 Height,Â 3.44 Top Diameter, 2.38 Bottom Diameter. These can be used for pint/pub glasses. I can see myself drinking some craft beer out of one of these. Also available in old-fashioned size. Use this oven-safe 9″x13″ black baking dish year-round for whipping up your next lasagna, casserole, a tray of brownies, or rectangular cake. This has a matte black finish and it has a bit of a rustic look to it. This oven-safe black casserole dish from Fiesta would be the perfect vessel for serving up your next casserole dish. These are constructed for individual meals. These are designed to hold 17 oz and the dimensions are: height 2 Inches, length 9 1/4 Inches, and width 5 5/8 Inches. The Fiesta Poppy is a festive and bright orange color. This place setting includes a lunch plate, appetizer plate, bowl, and a coffee mug. This is casual dinnerware that is designed for everyday use and you can mix and match with the other colors that Fiesta has available (which are a lot!). What Halloween Fiesta item is your favorite? Leave me a comment and let me know. At the time of publishing you can receive free shipping on orders $75+ AND use the promo code “THANKS” to save 25% off at Macy’s. 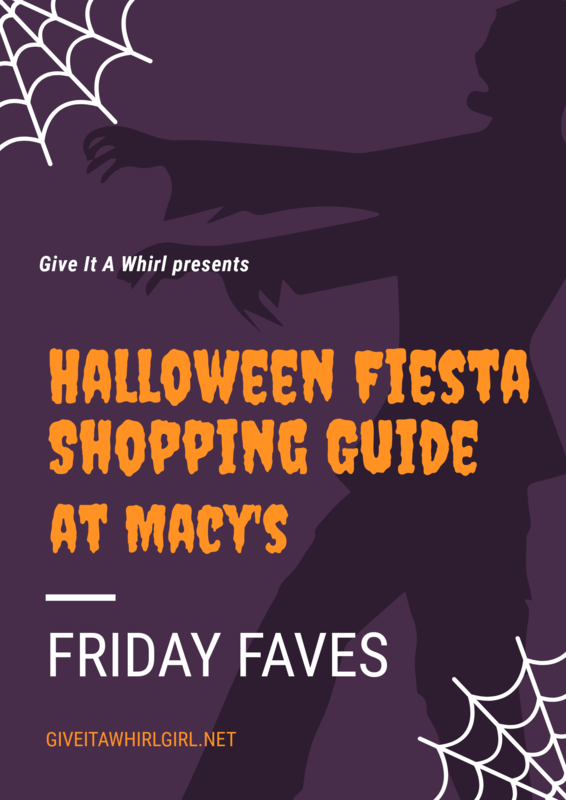 THIS POST CONTAINS MACY'S AFFILIATE LINKS. I DO RECEIVE A SMALL COMMISSION IF ITEMS ARE PURCHASED THROUGH THESE LINKS. ALL OPINIONS STATED HERE ARE MY OWN. Any commission I receive is used to better your blog experience here. This entry was posted in Friday Faves, Shopping Guide and tagged baking, bowl, casserole, coffee mug, Day of the Dead, Dia de los Muertos, drinkware, fiesta, fiestaware, free shipping, glasses, halloween, Macys, mug, pasta, pasta bowl, plate, promo code, pumpkin, shopping, skeleton, skull, witch. Bookmark the permalink.